Have you ever been so angry that you wanted to turn over a table? We see this all the time in movies and TV shows. Several people are sitting around a table in a restaurant or an office. One person gets so upset that they stand up and flip over the table – plates and silverware go everywhere, pens and note pads go flying. Pretty dramatic. In our gospel, Jesus takes it even a step further. He makes a whip out of rope and literally chases the moneychangers out of the temple area. 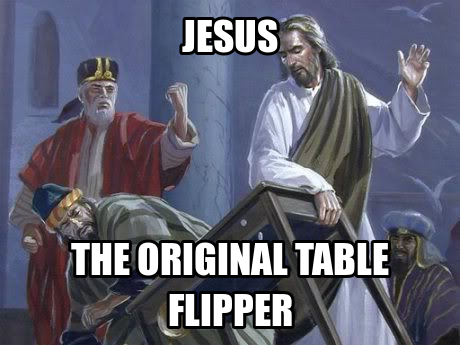 Whenever we see this portrayed in a Jesus movie, it looks like Jesus is pretty upset, just like every other table flipper. But was Jesus really angry? The disciples use a different word – zeal. Zeal is being greatly enthusiastic about an idea or mission. People who live with zeal are passionate, devoted, eager, intense, and even fanatical. So what is Jesus so fired up about? Jesus is zealous for his house, for the temple of the Lord. Jesus’ intense response was brought about because people were trying to profit financially off of people’s desire to get close to God.